Microsoft developed Outlook Express, a free desktop-based email client that comes free with Windows Vista, Windows XP, and older versions. But Microsoft has stopped the development and technical support for Outlook Express since 2015. Outlook Express is no longer the streamlined product of the big tech giant. But there are still many users of Outlook Express who need it for email communication. But with enhancements in technology, they looking for a solution to transfer emails from Outlook Express to Outlook on another computer, preferably Windows 10. To completely sort out the problem of Outlook Express, this post explains a quick solution to transfer files from Outlook Express to Windows Outlook with the help of SysTools DBX to PST Converter. But please keep in mind that the manual solution is a lengthy one. Despite this, it works fine and is absolutely perfect to transfer Outlook Express files to a new computer. The manual solution to export Outlook Express DBX to Windows Outlook contains 4 different methodologies which, together, help you transfer emails from Outlook Express to Outlook 2007 and 2010. By default, Outlook Express creates DBX files to save mailbox data. Follow these steps to export mail from Outlook Express. Start the Microsoft Outlook application. Go to Tools and then select Options. A new dialogue will appear. Then select >> Maintenance tab >> store folder button. Please copy the path of the store (required in further steps). Paste this path in File Explorer and hit Enter. Please save these DBX files in the USB drive or on any other storage media as per your ease. Paste the DBX files from the USB drive location on the new computer. The same process can be repeated with an address book of Microsoft Outlook Express. For this, you will require use of Windows Live Mail as the intermediate application between Outlook Express and Windows Outlook. The software can be easily downloaded from the Internet. After completion of downloading Windows Live Mail, please install and run on a Windows 10 operating system. Note: The Windows Live email client is available in the bundle with Windows Essential 2012. Search with this name, and you will get multiple resources for the same. Run Windows Live Mail Application. Go to File >> Import Messages. Please refer to the path where you have saved Outlook Express DBX files. Select the files which you want to transfer from Outlook Express to Outlook. 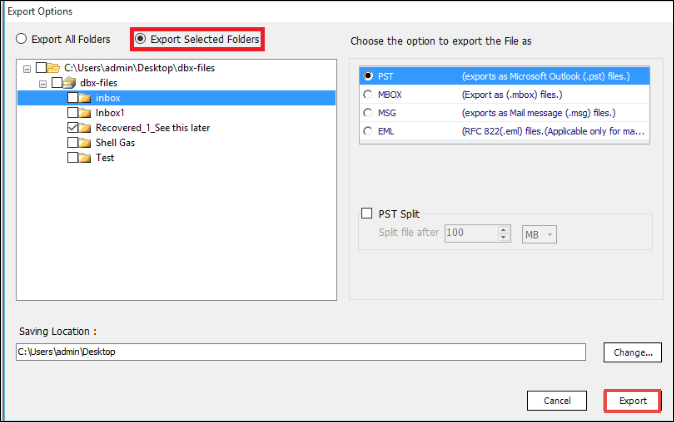 Choose the import button to import DBX files into Windows Live Mailbox. A similar process can be done with the Outlook Express address, but this time, you have to import WAB files instead of DBX files. This is the main step of all these procedures, and you have to proceed with this in the same manner as you did in the earlier stages of the migration from Outlook Express to Outlook. Start and run Windows Live Mail application. Click on File Tab >> Export >> Message Tab. A new dialogue box will appear. Select the Exchange tab. Please select all the folders which you want to export from Windows Live Mail to Microsoft Outlook on the Windows 10 operating system. Finally, close the export window pane. This step describes the procedure to import resultant PST files into Outlook. Go to File tab >> Open Import/Export Wizard >> Open Outlook Data Files. Go to the location where you have saved the resultant files and then click on OK.
By doing this, you have successfully transferred Microsoft Outlook Express files to Outlook 2016 on Windows 10 OS. Time-consuming and very lengthy approach. The minute errors will lead to major data loss. Technical expertise is required to successfully transfer emails from Outlook Express. Download and Run SysTools DBX to PST Converter and then click on the Add File option. Select the desired option from 2 default options to browse DBX files from local storage. The software automatically loads files for preview. The user can preview DBX files in 8+ preview modes such as Hex, MIME, Email Hop view, etc. Please select the emails or folders which you want to export, and then click on Export in the navigation bar. Select PST file format and then finally click on Export to complete the process. Microsoft Outlook Express was one of the most widely used email clients ever, but now, it has been overtaken by Outlook. But there are still users of Microsoft Outlook Express. With the passage of time and advancements in technology, there’s a need to keep up with changes in business complexity. So, this is the single step towards the dream of success. Keep following your dream. Have a good day!